What a wonderful weekend of fellowship, celebration and enjoyment, of near perfect weather and held at beautiful Luther Height Coolum. Women numbering 60plus from across several zones of L.W.Q., L.W.A. President Tuula Continarino and L.W.Q. President Karen Bryce attended the retreat. 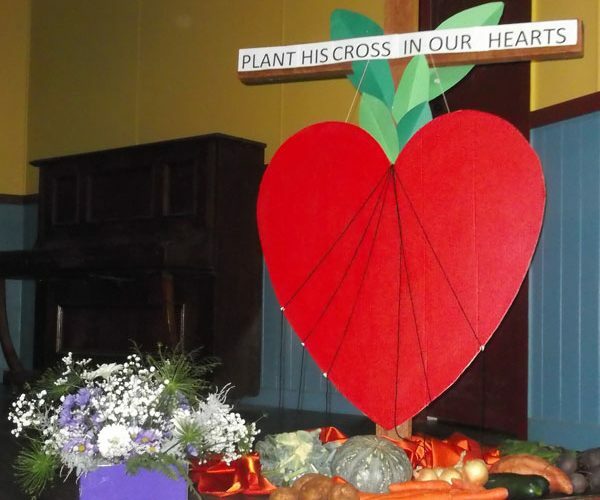 The theme for the weekend, “Plant His Cross in Your Heart”, was reflected in the large wooden cut out, colourfully emblazoned banner, which welcomed all as we entered the registration hall. Several beautiful floral arrangements and at least a dozen small wooden crosses, especially crafted for the occasion, completed the stage decorations. 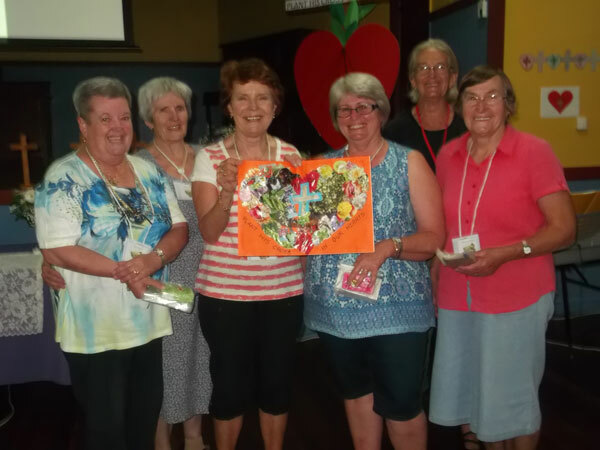 At registration we were presented with our name tags, which were printed with a small picture of either a fruit or vegetable, representing the produce of the Lockyer Valley, these emblems formed the teams for the weekend. Our weekend carry bags held a number of treats, tracts, apt messages, puzzles and delightful little wooden cross individually decorated and made by the year 7 students from Faith College. 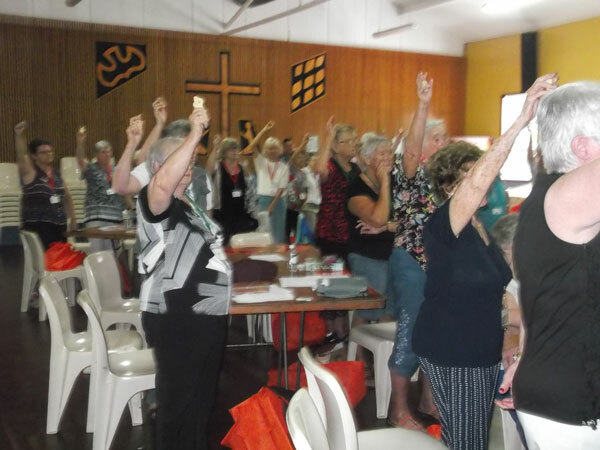 Each time our theme song was sung each lady held aloft this beautiful little reminder of our theme “Plant His Cross in Our Hearts”. 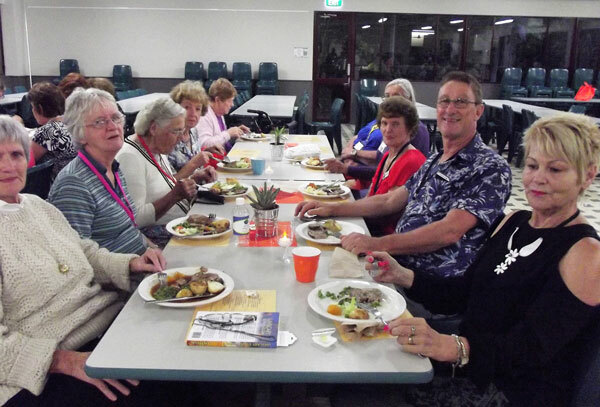 The evening got off to a lively start with teams finding their appropriate tables decorated with their chosen fruit or vegetable and individual place mats depicting the theme on an orange coloured background, the colour of West Morten Zone. A fast paced activity followed finishing 15 minutes later when each team presented a small paper banner depicting the theme. 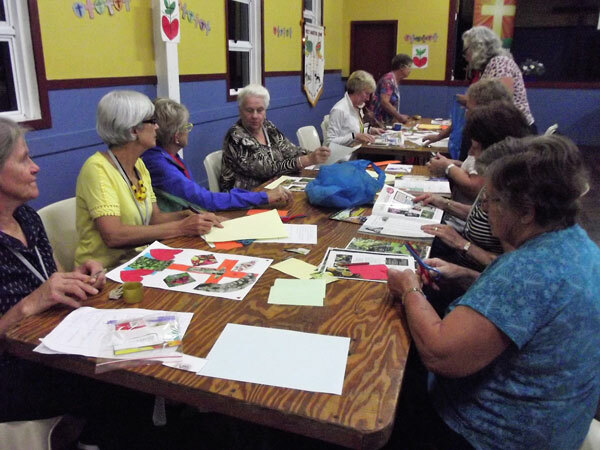 The little banners had been made using the pictures provided, cut out of women’s magazines. Completed banners decorated the walls of the hall and were later auctioned to enhance the weekend offerings. Dormitory devotions commenced our Saturday morning followed by breakfast at 7am. Our sessions commenced with praise singing including the theme song. Bible study followed led by Pastor Peter Geyer. Separating into our teams we discussed a number of questions, chosen by Pastor, reflecting our theme. The second study followed the same format with Pastor Peter encouraging us to contribute our personal reflections. Some closing thoughts included – ‘God’s primary purpose is to save people’ – ‘God has the full picture’ – ‘We do not see clearly’ – ‘Our task is to be faithful throughout life’ – ‘In all things God works for good’ – ‘Can we really see the distance without God’ and ‘If you love Me keep My word’, very thought provoking studies which were enjoyed by all. Our afternoon session began with more hearty singing of praise songs and of course our theme song with crosses held high. Guest speaker John Wagner, National Director of Mercy Ships Australia, who lives in Caloundra and is also a Lutheran, enthralled and challenged all present. John has been with Mercy Ships for 14 years and is lovingly supported by his wife Pat. The work of Mercy Ships is now being spread through television. Watch the ABC; they will soon be screening a Series of 8 which showcase the amazing work of Mercy Ships. The series may be titled ‘Surgery Ship’. An astonishing 70% of our world’s population have no access to surgical procedures. Mercy Ships have provided hope and healing to over 2.5 million during the last 39 years. It is a Christian based medical charity provided from the world’s largest hospital ship. They have had 4 ships in service. A new ship is now being built to unprecedented standards that will carry 1050 crew. This amazing craft, costing 167 million American Dollars, should be in service in 12 months’ time. Australia is now listed at number 2 in the world for its lifestyle and services provided; especially for its freedom and hospital systems. Great Britain is listed at 14. The Mercy Ship is now in Africa, then moves on to Cameroon. They spend 11 months in each port. In these areas statistics show that there are 8 doctors per 100,000 people. In Australia 1 doctor for every 275 people. In countries like these life expectancy is very minimal. Mother Teresa was working in similar areas; she supplied photos of a tiny baby lying dying on a desolate mound while close by stood a waiting eagle. It is a common sight to see up to 7,500 people standing in a queue at the dock to get help. Mercy Ships can only choose the most deserving cases. Their arms of love can only reach so far. As always the amazing surgeons, doctors and nurses all work voluntarily. World renowned maxillofacial surgeon, Dr Gary Parker, is one of many astounding surgeons who give considerable time serving the needs of the underprivileged. Many countries visited are not Christian, voodoo is common. Here it is forbidden to be seen as Christian. Many asking why are you doing this for me? Up to 35,000 people can be assisted in one 11 month visit. During their time in port Mercy Ships also provide training to surrounding communities so they can help themselves to a better standard of living. Since 1978 Mercy Ships has transformed millions of lives all on board hospital ships docked in ports. Patients treated 2,516,000; Healthcare professionals trained 36,650 and Community Development Projects 1,100+. Rotary and many renowned identities support Mercy Ships. Please pray for John Wagner and all those hundreds of people who give of their time, talents and provisions to provide this amazing service in the love and example of a serving God. Following Saturday evening dinner we were treated to a concert of exceptional quality provided by very talented students from Pacific Lutheran College, Caloundra. Soloists, choirs, bands and teachers held us in complete captivation. Congratulations and God’s blessings to all who assisted, in any way, in providing this entertainment for our privilege. Sunday morning’s church service was led by Pastor Peter Geyer and was titled ‘Cross Eyed Christian’. The cross of Jesus was all, for you and me. Enhancing the service was the 9 member choir who sang ‘Nothing in all Creation can separate us from the Love of God’ and ‘The Old Rugged Cross’. Service closed with the singing of ‘Shine Jesus Shine’. Offerings from across the weekend were divided between Mercy Ships and L.Y.Q. Luminate, $1000.00 each. Following morning tea, L.W.A. President Tuula and L.W.Q. President Karen presented comprehensive reports. To camp co-ordinator & President, Shirley and her great team, congratulations and thank you. Praise the Lord He gave you both strength and ability to provide us with an exceptional weekend. God bless you all.